How to reset a diseased cell. In proof-of-concept experiments, researchers at University of California demonstrate the ability to tune medically relevant cell behaviours by manipulating a key hub in cell communication networks. The manipulation of this communication node, reported in the journal Proceedings of the National Academy of Sciences, makes it possible to reprogram large parts of a cell’s signaling network instead of targeting only a single receptor or cell signaling pathway. The team state that the potential clinical value of the basic science discovery is the ability to eventually develop techniques, drugs or gene therapy approaches, for example, that could slow or reverse the progression of diseases, such as cancer, which are driven by abnormal cell signaling along multiple upstream pathways. The current study showed the feasibility of targeting a hub in the cell signaling network to reset aberrant cell signaling from multiple pathways and receptors. The team engineered two peptides, protein fragments, to either turn on or turn off activity in a family of proteins called G proteins. 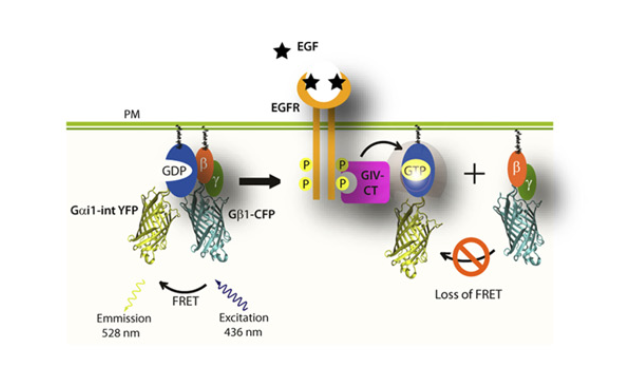 The team explain that G protein-coupled receptors, commonly found on the surface of cells, enable cells to sense and respond to what is happening around them. About 30 percent of all prescription drugs affect cells via G protein-coupled receptors. Previous studies have shown that G proteins can also be activated inside cells, not just on cell membranes, by other receptors, including a protein called GIV. Its activity is also implicated in cancer metastasis and other disease states. Both the ‘on’ and ‘off’ peptides were made from a piece of the GIV protein receptor. Using a series of cell culture experiments, the researchers showed that ‘on’ peptides accelerated cells’ ability to migrate after scratch-wounding, a process linked to wound healing. The ‘off’ peptide, in contrast, reduced the aggressiveness of cancer cells and reduced the production of collagen by cells associated with liver fibrosis. In experiments with mice, the topical application of the ‘on’ peptides helped skin wounds heal faster. The team surmise that the medical community can begin to tap an emerging new paradigm of G protein signaling. activation of Gi. Therapeutic effects of cell-permeant peptides that activate G proteins downstream of growth factors. Ghosh et al 2015.